A cool and rainy spring in Saint Paul keeps me cooking indoors. Typically I’d be raking together a salad while Dave grilled chicken or salmon. 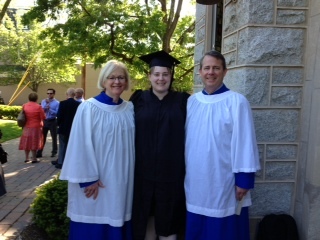 Instead, just back from our happy daughter Emily’s graduation from seminary at Princeton, I’m slaving over a hot stove. Well, not really. Here is Emily with her proud parents. We sang in the choir! 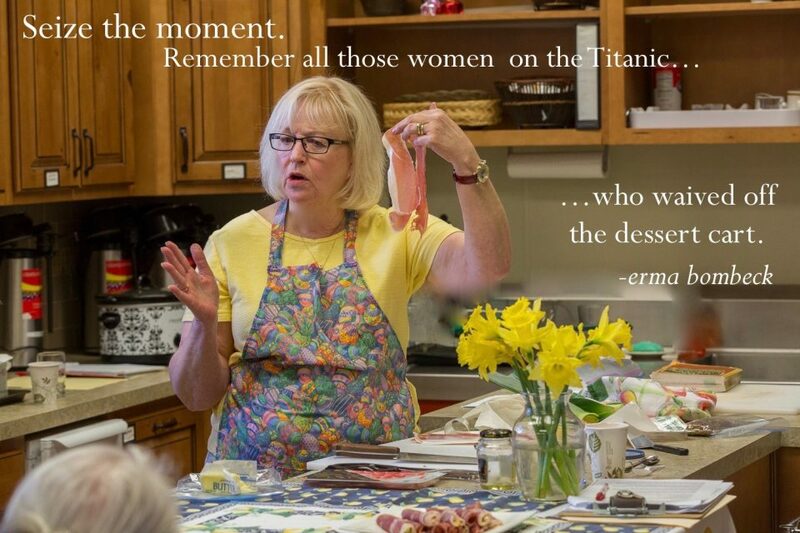 Go, Emily! 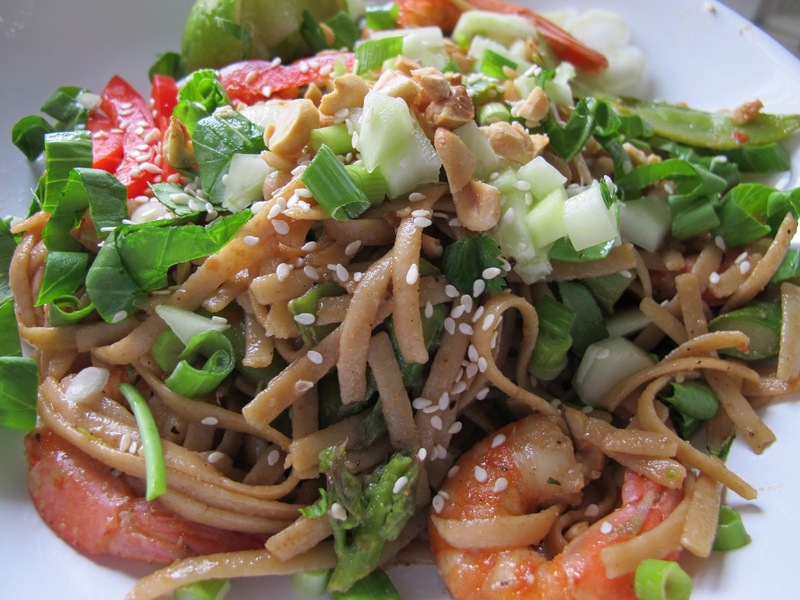 I will say that once I decided to make and blog some Asian noodles, they were everywhere I looked online. Like this version from FOOD AND WINE. I ignored all that and forged ahead. Hmph; great minds think alike, etc. If you’re looking for something luscious, filling, and healthy for dinner with plenty leftover for a cold lunch or tomorrow’s dinner, this is your meal. 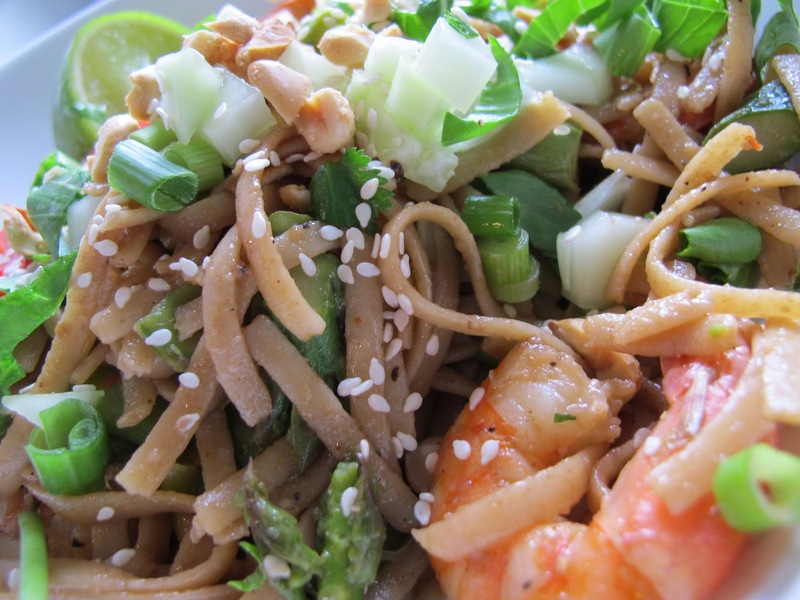 The short story is that you cook up some noodles with snow peas, asparagus, and shrimp. You stir in all kinds of things to make it taste good, and let your family or guests choose their toppings — a variety of chopped vegetables, sesame seeds, lime and nuts– at the table. OR: Add just the vegetables and “sauce” ingredients (skip the shrimp), along with the peanut topping, and you have a great side for meats you might be grilling for Memorial Day. I picture this with salmon, pork chops, or chicken, perhaps those that have been lolling around in an Asian marinade before grilling. 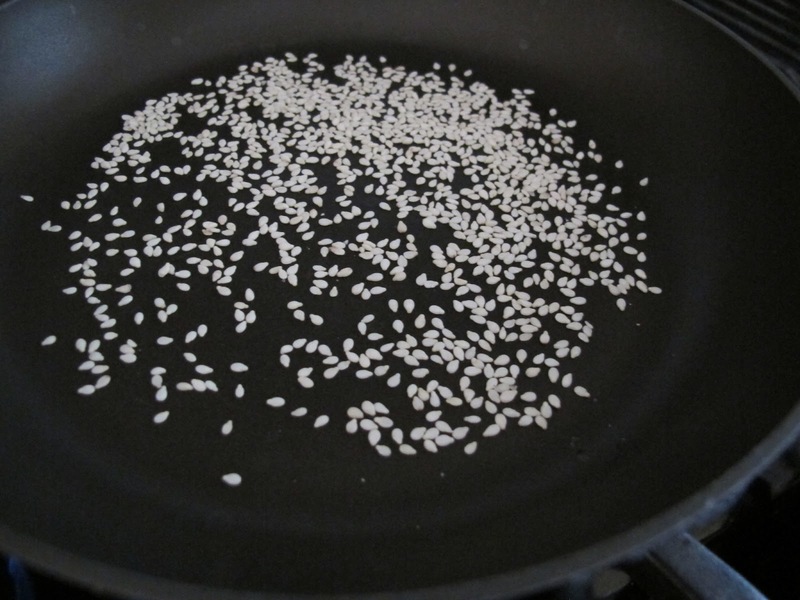 Place 2 tablespoons sesame seeds in a small skillet over low heat and toast, stirring occasionally, for several minutes until light brown. Remove from heat; pour into a small bowl and place on table. Chop 1/4 cup plain peanuts, scoop into another small bowl, and place on table. Pour 2 tablespoons canola oil into the skillet over low heat and add 1 tablespoon each minced ginger and garlic. Cook a minute or two or just until garlic begins to color. Remove from heat and set aside. Bring 5-6 quarts of salted and peppered water to boil for the pasta. 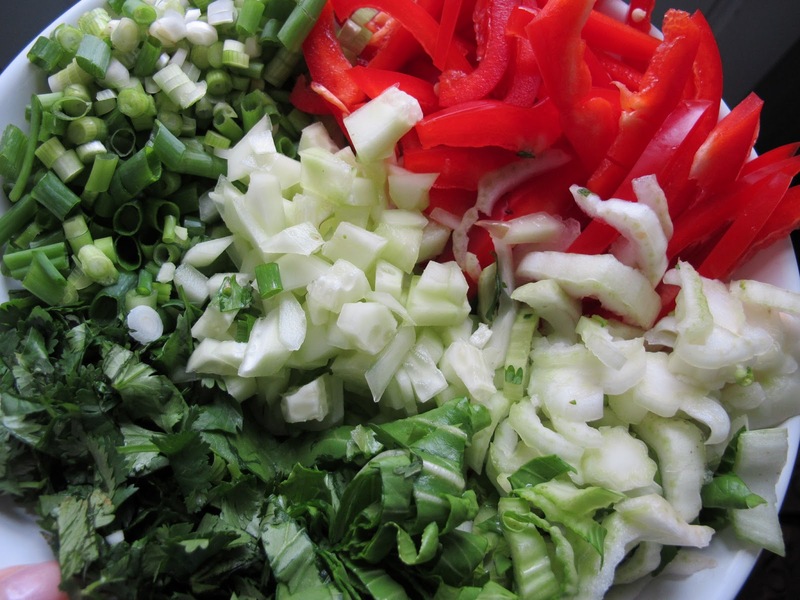 While it heats, chop 1/2 cup each bok choy, fresh cilantro, scallions (green onions), and cucumber. Chop all of one red bell pepper. Cut a lime into wedges. Place the vegetables and the lime wedges side by side in a large bowl or in separate small bowls and put them on the table by the sesame seeds and peanuts. To the by now boiling water, add one pound whole wheat linguine (I like Whole Foods 365 brand best) and cook for about 7 minutes. 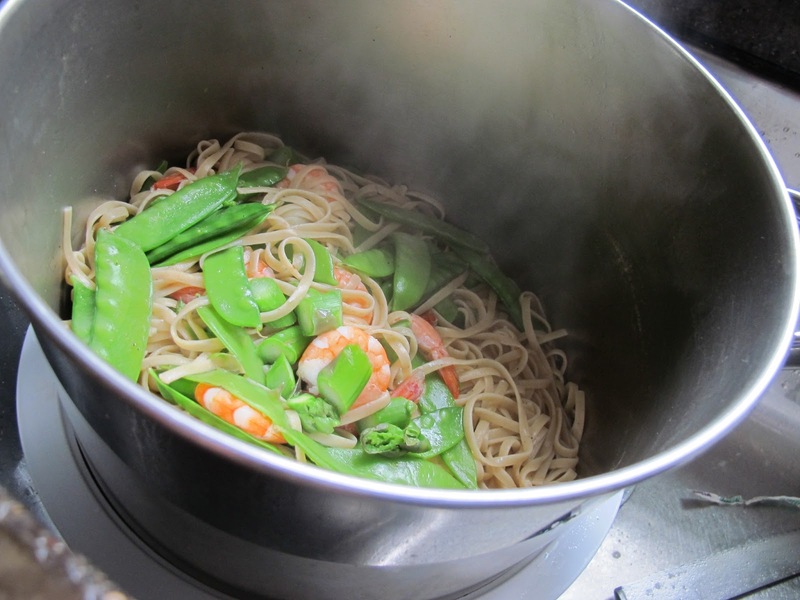 Stir in 3/4 pound (12 ounces) fresh peeled and deveined shrimp, a cup each of stringed+ fresh snow peas and chopped fresh asparagus and cook for 2-3 minutes until shrimp is firm and pink and noodles are nearly tender. Drain pasta, shrimp, asparagus and peas. Pour back into the pot and, while hot, stir in garlic-ginger oil, a generous pinch of crushed red pepper, 1/4 teaspoon each kosher salt and fresh ground pepper, 1/4 cup soy sauce and 1 tablespoon + 1 teaspoon sesame oil, 1 teaspoon of Sriracha, and the juice of one lime. Taste and adjust seasonings, adding more Sriracha, soy sauce, sesame oil, or lime, if needed. Serve warm, at room temperature, or cold in shallow pasta bowls; pass fresh vegetables, extra lime slices, soy sauce, and chopped peanuts so that guests can add what they’d like at the table. +Destringing snow peas If you don’t destring your snow peas, you’ll be flossing (without meaning to) during dinner. If you have a vegan or vegetarian in your group, cook the shrimp separately and place it in a separate bowl on the table. You could add sauteed tofu, if desired, or 2 -3 tablespoons peanut butter to the soy sauce mixture. If you have leftover cooked chicken, you can add sliced chicken with the garlic-ginger oil instead of cooking shrimp with the noodles. Vegetables are very interchangeable; please add what you have or you like. 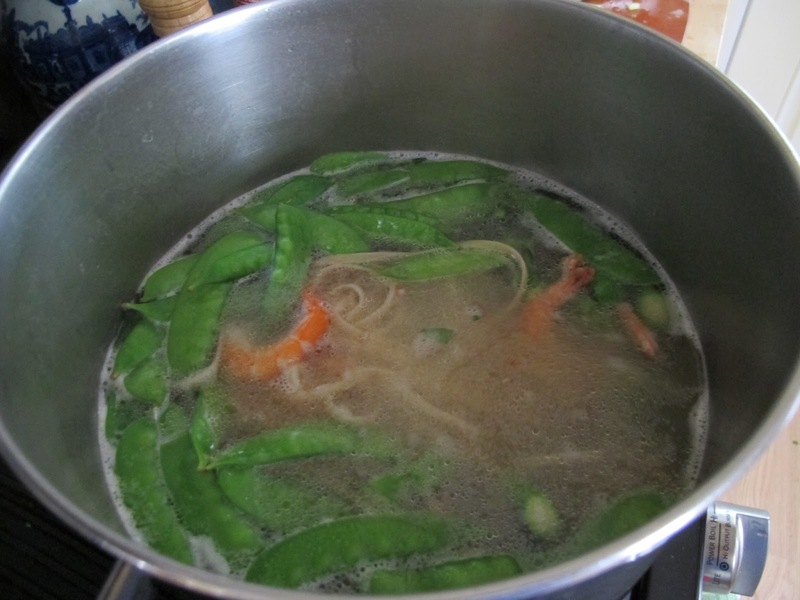 For instance, julienned carrots could be used instead of asparagus or sliced celery in place of the snow peas. 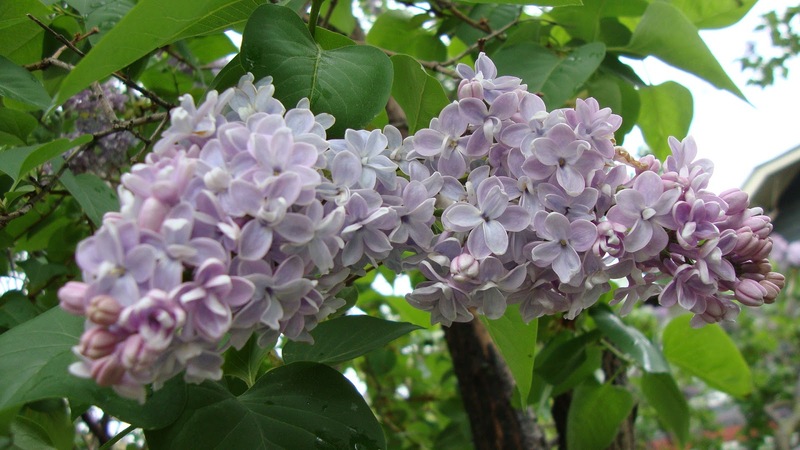 My lilac are in bloom–finally. But it’s too cold and rainy to go enjoy them. Hopefully tomorrow!